FRANKFURT, Germany Judging by the slew of electric and hybrid vehicles being rolled out at the Frankfurt Auto Show, it might seem carmakers are tapping a large and eager market. But in fact almost no one buys such cars -- yet. Every major automaker is coming out with electric versions of existing vehicles -- such as Volkswagen's all-electric versions of its Up! city car and Golf compact -- or ones they have designed as electrics from the ground up, like small BMW's electric city car aimed i3. Analyst Christoph Stuermer at IHS automotive called Frankfurt "the first full-throttle electric propulsion show" that's about "getting electric drive cars out of the eco-nerd, tree-hugger segment and into the cool group." To whet appetites, automakers are making high-performance, luxury versions that give up little or nothing in performance to conventional models. 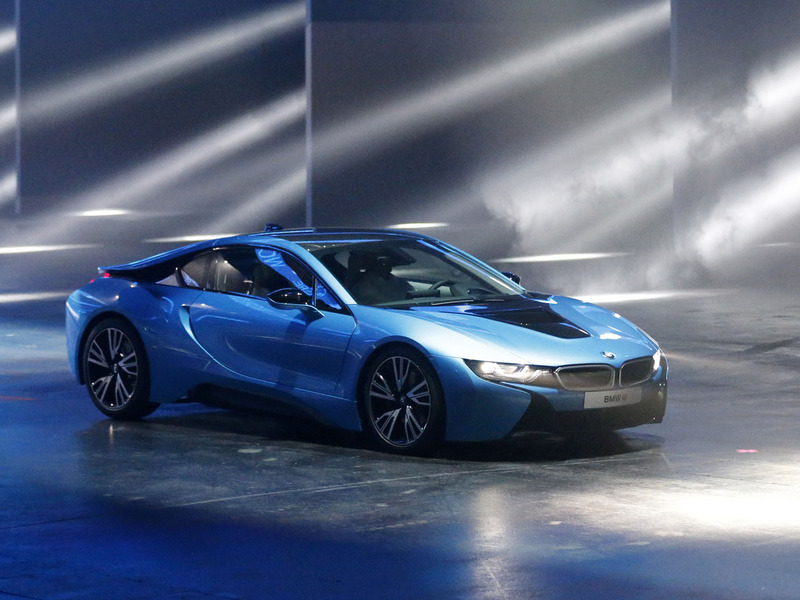 BMW's i8 goes 0-62 mph in a speedy 4.5 seconds. Audi's Quattro sport concept -- meaning it's for demonstration, not for sale -- is an aggressive looking sports car with large air intakes flanking the grille and a whopping 700 horsepower from its hybrid drive. The company says it can reach 190 mph. The Mercedes S-Class plug-in hybrid version, meanwhile, has a powerful six-cylinder internal combustion engine plus an all-electric range of about 20 miles. This way, owners could commute all-electric during the week, recharging overnight -- but use the gasoline engine on a family vacation. The company says mileage is 78 miles per gallon. All this, to cater to a market that doesn't really exist in mass terms. Only 0.2 percent of all cars registered in Europe are hybrids, which combine batteries with internal combustion engines, or electrics, according to the ACEA European automakers association. In the United States, the Toyota Prius hybrid has broken into the top 10 selling passenger cars. However, electric vehicles have struggled to increase sales numbers because of high prices and so-called range anxiety: Buyers' fear of running out of power. Analysts and executives say there are several solid reasons to make and promote such cars now. They can help lower average fleet emissions to meet government requirements -- in Europe, offsetting increasing sales of conventionally powered sport-utility vehicles. And automakers want to be ready in case governments -- perhaps in heavily polluted China -- push people into emission-free vehicles. "Short term, nobody will get a return on these investments," Daimler AG chief executive Dieter Zetsche told The Associated Press. "But definitely, long term, the development will go in this direction, and if you don't learn this lesson today you will not be in the game tomorrow." "All these technologies have to be developed further and you can only do that, including industrial processes to reduce costs, by selling them." Volkswagen CEO Martin Winterkorn said one key to getting the hybrid and electric market moving is reducing the cost of the most expensive element -- the battery. The company's goal is to cut the cost of a unit of battery power by a factor of five over the next several years. Winterkorn said the company had included electric and hybrid models in the company's multi-platform manufacturing system. This standardizes parts and allows the same assembly line to produce multiple vehicles. That means a new electric could have modest sales numbers -- but not involve the expense of additional plant capacity and parts design. The U.S. government is requiring automakers to increase fleet mileage standards, and the European Union is requiring them to cut emissions by 2020. Auto analysts say electrics could get a further push if China or its biggest cities start encouraging or requiring them to lower choking pollution levels. The Chinese Cabinet issued a development plan last June that calls for the number of electric vehicles to rise to 500,000 by 2015 and then to 5 million by 2020. Buyers of electric vehicles will be entitled to government subsidies, and exempt from restrictions on car purchases. One of the biggest bulls is Renault-Nissan CEO Carlos Ghosn, whose company has bet heavily on the all-electric Leaf. He said much of the industry is waiting now to see what China's next move is on reducing emissions. When China acts, it will mean "the explosion of the electric car."